In this version, a number of additions occurred. Works both with static variables, and with dynamic ones. Improved Visual Editor. There was an opportunity in the KEY block to specify not only the numeric key code, but also text and pauses between clicks. 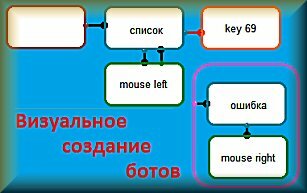 Due to this, the work of the script not in the background will not depend on the shift of the program window where automation occurs.